Its hard to gain an accurate reading of this seasons Juventus – They seem to flip between moments of great brilliance, moving the ball fast, countering with lightning pace and intelligent passing….to moments of drab and dreary football, trudging slowly up the pitch, camping out in the opponents half, laboriously passing the ball left and right before inevitably conceding possession or wasting a perfectly good chance by firing the ball over the bar or straight at the keeper (See last weekends 1-0 victory over Palermo). It can be infuriating to watch. Something isn’t right, and it’s debatable what that ‘something’ is. I’ve read comments on social media where people are all too quick to call-out certain players for their mediocre performances while others urge caution and insist that in time, this team will come together to devastating effect. I’m inclined to agree with the latter – All the component parts are there for this Juve to be a serious force both domestically and in Europe….it remains to be seen if Allegri can get them all working to their absolute best. Obvious problems lie in midfield – The alternating trio of Lemina, Pjanic, Khedira and Asmoah simply doesn’t look up to the task. That’s not to fault their efforts so far, because at times, they have shown some real spark and industry, but in those same games, we often lack urgency, making heavy and hard work of creating chances for the forwards. Injuries haven’t helped our cause, nor has the failure of the management to invest in another central/defensive midfielder….but this is something we simply can’t dwell on. It’ll either be fixed at Christmas or we’ll wait until next summer. My sincere hope is that we agree a quick deal with Zenit and add Axel Witsel to our ranks in the winter break. Granted, he’s untried in Serie A, but he’s eager to play for us and eligible to play in the Champions League – Both are huge positives. Having a quick browse of the headlines in Italy this morning, the general theme seems to be the same – Various pundits and assorted former legends of the game casting a critical eye on the current Juve lineup. Understandable, given that performances haven’t quite matched up to expectation…..but I have faith in Allegri and in the team. If they are to prove their credentials in Europe, it has to start with this game. Given Juve were favourites for the Champions League this year, you can get a decent return on them and it’s worth checking promo coupons for the latest match odds. There simply cannot be any excuses in a game like this and only 3 points and a confident victory will suffice. It might be harsh to expect both so early in the season, but the truth is, even with the European competition in the summer and a string of injuries, we should have been better prepared. Medhi Benatia is out, as are Kwadwo Asamoah and Daniele Rugani, both picking up injuries in the Palermo match that could see them out for over a month each. They join Claudio Marchisio and Rolando Mandragora on the sidelines, leaving us lacking any cover in defence and limited options in midfield. That said, we can still use an almost full strength starting XI against Dinamo tomorrow. Gigi was largely untroubled against Dinamo and he’ll start in goal. The defence is a worry and my initial thinking was a lack of cover there might force Allegri into a back 4, but I was being optimistic. According to GdS and Sky, the 3-5-2 remains intact, meaning Leonard Bonucci, Andrea Barzagli and Giorgio Chiellini at the back and Dani Alves and Alex Sandro playing in the wing-back positions. 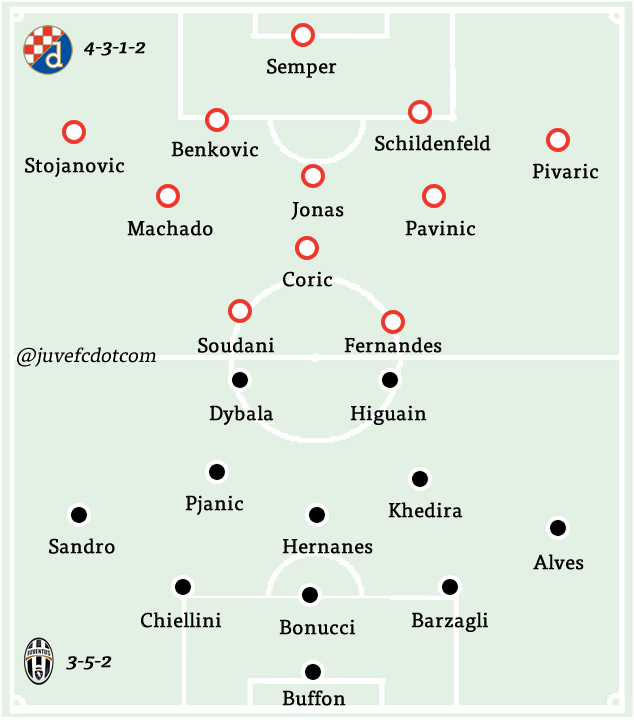 In midfield, I think Hernanes might get the nod with Miralem Pjanic and Sami Khedira flanking him on either side. Up front, it can only be Paulo Dybala and Gonzalo Higuain. 3-5-2: Buffon; Barzagli, Bonucci, Chiellini; Alves, Khedira, Hernanes, Pjanic, Sandro; Higuain, Dybala. I’ll be the first to admit, i know precious little about Zagreb. What little i do know, I’ve gleaned from various blogs and websites. It seems the boys from Zagreb have had a tough month – They went through much of the year in great form, losing only one league game in March against Hajduk Split, winning and drawing the remainder from February to August. An impressive run, but things started to fall apart in September. A home loss to Osijek was swiftly followed by a 3-0 loss to Lyon in their first Champions League game and rounded off with a humiliating 5-2 defeat to Rijeka. Following the defeat, coach Zlatko Kranjčar left the club, handing over the reigns to caretaker coach Željko Sopić. Results have improved in recent weeks with a solid 5-0 cup victory over Veli and a positive 1-0 victory over Lokomotiva in the league. Croatian national paper Daily Sportske novosti suggests that injuries might hamper Dinamo in this game – They have a big problem at right back with Petar Stojanovič and Alexandru Matel injured. Captain Domagoj Antolić is not 100% fit yet and is doubtful for the match. Local journalists have suggested that Dinamo still don’t look at their best and the coach is likely to use a defensive 4-3-1-2 formation which will aim to sit back and soak up Juventus pressure.